This Pine Cone and needle patterned hexagon inverted light with pine branch accents is suspended from chains. The Inverted Pinecone Chandelier is illuminated through Pine Green art glass panels with Beige art glass panels and a pinecone and needle accent. The pinecone chandelier is finished in Cafe Noir. 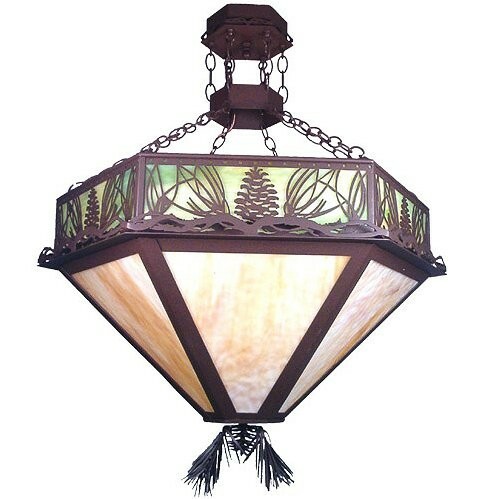 This Pine Cone and needle patterned hexagon inverted light with pine branch accents is suspended from chains. The Inverted Pine cone Chandelier is illuminated through Pine Green art glass panels with Beige art glass panels and a pine cone and needle accent. The pinec one chandelier is finished in Cafe Noir.